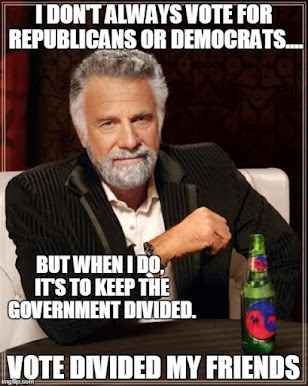 The Dividist Papers: Mr. Sullivan - May I show you your petard? Mr. Sullivan - May I show you your petard? In the event my title is a bit too obscure, pictured above is Mr. Andrew Sullivan lighting his petard, shortly before he is about to be hoisted by same. 1. A small bell-shaped bomb used to breach a gate or wall. 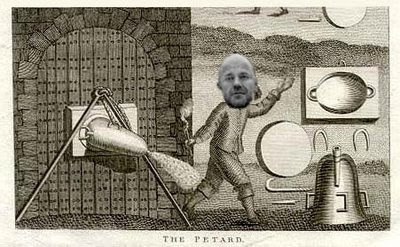 Word History: The French used pétard, "a loud discharge of intestinal gas," for a kind of infernal engine for blasting through the gates of a city. "To be hoist by one's own petard," a now proverbial phrase apparently originating with Shakespeare's Hamlet (around 1604) not long after the word entered English (around 1598), means "to blow oneself up with one's own bomb, be undone by one's own devices." The French noun pet, "fart," developed regularly from the Latin noun peditum, from the Indo-European root *pezd-, "fart." And further, please consider we are looking at: A high probability of a Democratic President, a 100 seat Democratic majority in the House of Representatives under Nancy Pelosoi; A 60-40 filibuster proof super-majority in the Senate under Harry Reid or Hillary Clinton; And the largest concentration of single party federal power in the lifetime of most readers of your blog. So, in consideration of all that, I was wondering if you thought it no longer important to your readers that the nation is careening at high speed down a highway to single party government hell in 2009? There is a major problem with Bartlett's solution to the "nightmare scenario" of single party Democratic government in 2008 - specifically his suggestion of focusing on Republicans retaking the House of Representatives in 2008 to maintain divided government. The problem with that advice, even when he wrote it last year, is that it is flying in the face of history and willfully ignoring the state of the Republican Party and House elections. The problem, is that it is impossible for the GOP to retake the House or Senate in 2008. In the 100+ years since we have been electing senators directly, the House of Representatives has never switched majority unless the Senate did also. "Never" as in "not even once". This is a law of politics like gravity is a force of nature. So what about the Senate? As I have been explaining since the week after the mid-terms, there are 33 Senate seats contested in 2008. Of these, 21 are held by Republicans and 12 by Democrats. Simple numbers - the Republicans have a lot more at risk, and will be playing defense. The Democrats have many more opportunities to take seats than Republicans. Advantage Democrats. Big, big advantage. The question is not whether the Democrats will increase their majority in the Senate, the question is whether they will achieve a 60-40 filibuster proof super-majority. Right now, it looks like they have a super-majority in their sights. Since there is no plausible scenario for history to be upended in 2008, the best and only chance for the continuation of the divided government that Sully so admirably supported in 2006, is if the Republicans can hold the White House. The fact is Mr. Sullivan, that when you argue for the inevitability of an Obama victory, you argue for a massive concentration of single party Democratic power and even fewer fetters on a unitary executive than were on President George W. Bush. That is unlike the soul of any conservative I have ever known. 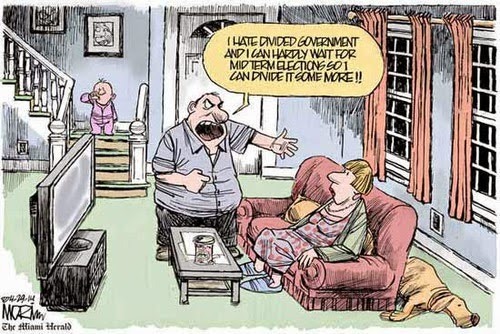 Regardless of how much you personally like and respect Obama, I have to wonder if this is really what you want? Do you really want to see that much power invested in one man without checks, balances, and a vigorous opposition party? Are you going to finally ask your readers (as you did in 2006) to help avert the "nightmare scenario" Bartlett invokes, hold their collective nose and vote for McCain to secure divided government? And to do so as you so eloquently put it - "For the country's sake - and for the soul of conservatism." I believe the fuse on your petard is lit, sir. Cross-posted at Donklephant. There are some interesting reactions and an entertaining back and forth in the comment thread. Check it out. Technorati tags: Barack Obama, John McCain, 2008 election ,Divided Government, Andrew Sullivan, Democrat, Republican.